After 17 years, the Melvins will finally release an album they started in 1998 with Mike Kunka, bassist of noise rock duo godheadSilo. 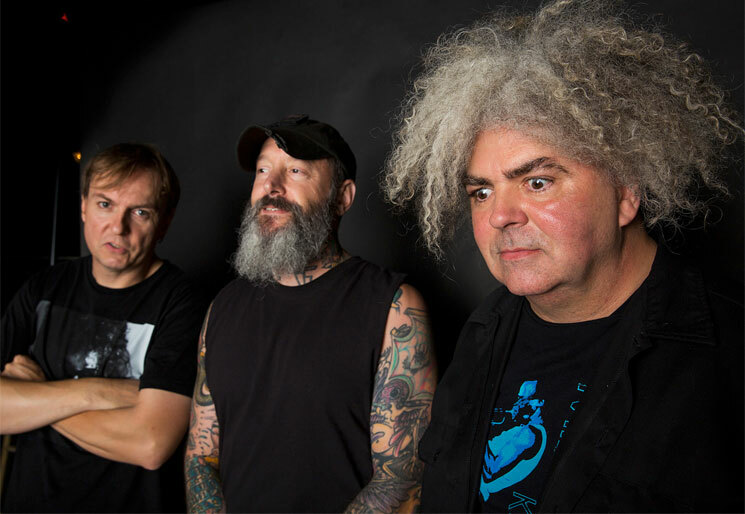 "We had done the basic tracks for it and then he just kind of disappeared," Melvins drummer Dale Crover reveals in a new interview with Exclaim! TV. "And then recently he came out of the woodwork and wanted to finish the record, and we just finished that up." Once they got the tracks from Kunka, the band added some more vocals and a few overdub, but Crover notes, "Most of it was already there. I think it came out really good." Melvins vocalist/guitarist King Buzzo adds, "Honestly, I didn't remember writing some of the songs at all. I know I wrote a lot of them, but I don't remember at all writing [some of] them." The band had been asked about the recordings in the past but assumed it would never come out because it was was out of their hands, with their parts already finished and a vanished contributor. The release is also notable because it will be the first time the Montesano, WA band will release something through nearby Seattle-based label Sub Pop Records, who famously helped kick off the grunge movement by releasing records by the likes of Soundgarden, Mudhoney and Melvins affiliates Nirvana. Of course, the partnership is also intriguing because the Melvins have been called the "Godfathers of Grunge." As of yet, the collaborative album is without a firm release date, but you can watch the full Exclaim! TV interview below.